My first day at d.trio was April 22nd, 2013 and was filled with a couple meetings and reading as much as I could on our current projects. My first day at d.trio was 8 years ago today. To the day. I spent the first two days sitting on a stool at the front bar because my office was still under construction. They’d hired me in November and I’d been waiting weeks to be able to start. From what Maureen says, she wanted to wait until my office was ready but I kept bugging her so she let me come in. As I remember it, I emailed once a week to see if I could quit my old job yet. I spent that first day and the next perched on that stool reading reams of brand standards from d.trio’s large corporate clients. I put my chair together and stuck it in a corner to wait with me. I tried to get to know people’s names and not let them see how nervous and discombobulated I was. I went home and cried. Not because I didn’t have an office but because I had just made a huge leap of faith, leaving a job I’d had for a long time, that was comfortable and safe and, if not easy, then at least familiar. Here I was in a brand new place that I knew would challenge me and push what I thought I was. Maybe I’d made the wrong choice, maybe I didn’t belong here. The past eight years have been wonderful and terrible and beautiful and hard and everything I hoped they could be on that first day, and nothing like I thought they’d be. And that first day was the last day that I ever thought maybe I don’t belong here. In honor of d.trio’s 15th anniversary we’ve asked all of the current employees to write two microblogs. One about their very first day at d.trio, the other about where they were 15 years ago. Obviously for some (3), those will likely be the very same. You’ll see these microblogs scattered around and we hope you enoy our brief looks back, thanks for being on the ride with us, we couldn’t do it without you. It’s that time of year when industry experts, pundits and prognosticators put forth the top trends to watch in the coming year. For banking, it’s a complex and varied list. There are more significant trends now to monitor in a single year than there were in an entire decade not so long ago. Banking is undergoing some seismic and fundamental changes. Business as usual has been ever not so for some time. With change and uncertainty come anxiety and risk, but also excitement and opportunity. It’s a brave new world and it’s never been more stimulating to be a part of it, especially as a marketer. Many of the most provocative trends have ties to marketing strategy and execution, highlighting the continuing evolution of the practice’s role within the industry. It takes a thick skin and iron constitution, but the ride can be both thrilling and fulfilling. Ah, January, when the snow flies and the trend forecasters are all in bloom. It’s that time of year again when the predictions are rampant. I’m sure you’ve heard by now that Pantone has declared Marsala the color of the year. We’re all in favor of deeply pink wine shades, but thought it would be interesting to see what some other prognosticators have to say on the subject. Color Marketing Group, which was founded in 1962 is an international organization whose members “interpret, create, forecast, and select colors in order to enhance the function, salability and quality of manufactured goods.” They’ve been issuing color forecasts 19 months ahead of the year for a long time. Below are the colors they believe will dominate in 2015. 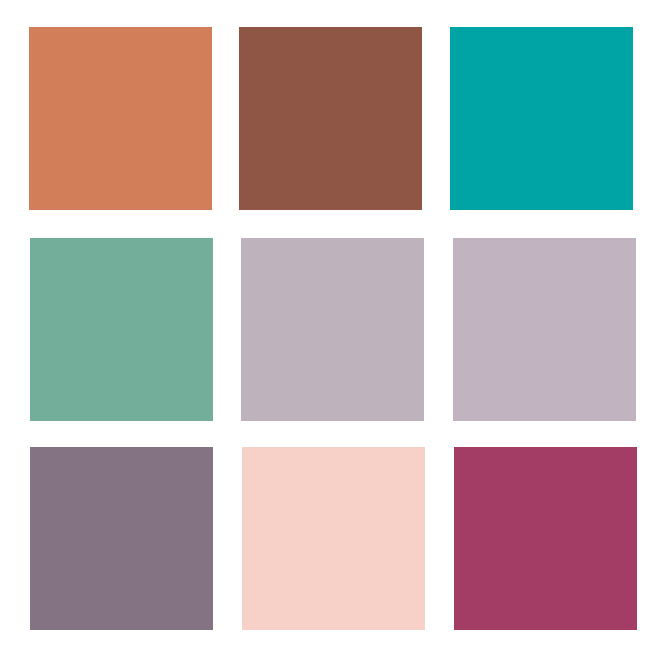 Lots of warm grays and earth tones, and one very marsala looking deep pink. If you’re interested in some other trends in the marketplace for 2015, check out Trends and Change to Watch in 2015 from JWT. 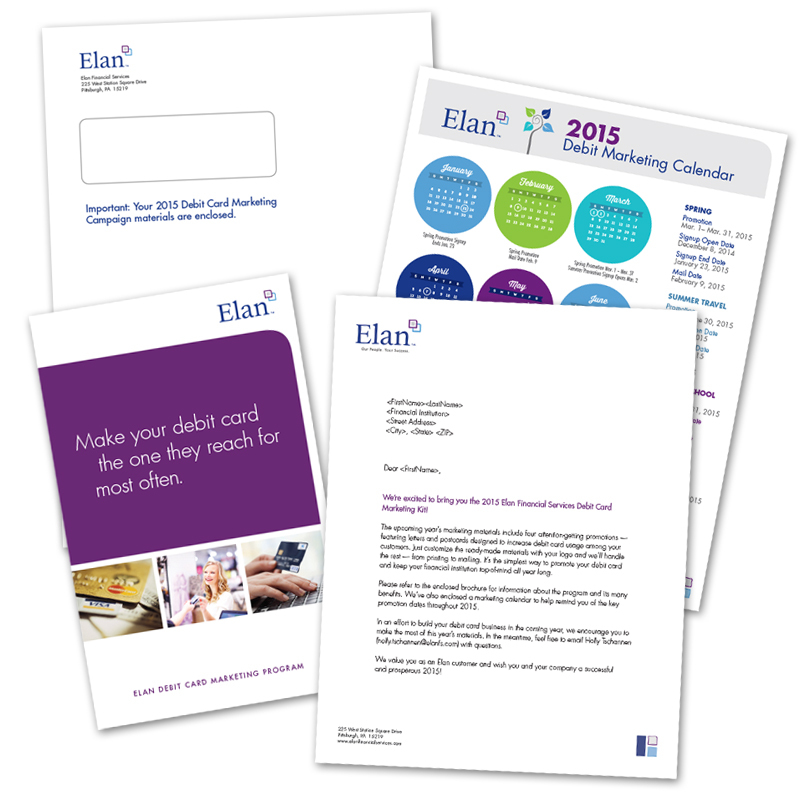 Elan Financial Services offers their ATM and debit card customers (financial institutions) professionally developed, turnkey quarterly marketing programs to make debit card marketing to the end cardholder easy and cost effective. To help increase program participation, a 2015 marketing kit was created and mailed to their customer base. The purpose of the kit was to generate excitement, reinforce the benefits of participating in the quarterly debit promotions, and communicate important program information and key dates. Contents included a 9”x12” envelope with personalized letter, tri-fold brochure, and full-page calendar. Additional kits will also be kept on hand and used as an onboarding tool for new debit marketing customers.